In the Hindu mythological story of Samudra Manthan, you can know how the two asuras Rahu and Ketu take revenge on Surya (Sun) and Chandra (Moon) by engulfing them from time to time. And thus cause the grahan i.e eclipse of Sun and Moon. In Vedic astrology, Rahu and Ketu are referred as 'chaaya grahas' i.e shadow planets and not the physically existing planets. Rahu is considered as the reflection of Saturn while Ketu is considered as the reflection of Mars. Rahu and Ketu are the imaginary / astronomical points of intersection in the universe. The South and North points where Moon's path intersect with Sun's path, is known as North Lunar Node and South Lunar Node. 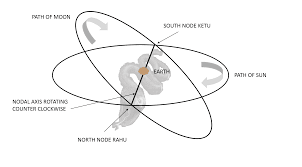 In Hinduism the North intersecting point is named as Rahu while Ketu is the South node. Hence Rahu is considered as the head of the snake while Ketu is believed to be the body part with tail of the snake. According to Vedic astrology Rahu and Ketu are the invisible planets and are the greatest enemies of Sun and Moon. According to Hinduism when Rahu / Ketu engulf Surya it is known as Surya Grahan and when anyone of these engulf Chandra it is known as Chandra grahan. When the grahan starts from upward, it is known as Rahu Grasta Grahanam and when it begins from downward direction, it is known as Ketu Grasta. Earth and 7 planets revolve around Sun in their own orbits. Moon which is the natural satellite of Earth, revolves around Earth in it's own orbit. At times, during the revolution of Earth around Sun and Moon around Earth, all the three heavenly bodies come in a straight line. When these come in straight line, one heavenly body casts its shadow on the other and thus causes eclipse of Sun or Moon. This is a wonderful play of light and shadow of the celestial bodies which is witnessed by the people on Earth. Total Solar Eclipse (Sampoorna Surya Grahan) - This is a rare occurrence that can be witnessed on a very small area on Earth. During this time Sun is fully covered by Moon for a minute or two and the sky becomes dark almost like night. One can visit the spectacular Diamond Ring formation for a fraction of a second immediately after totality. Solar eclipse should not be watched with naked eyes as it might harm eyes and one may permanently become blind due to emission of highly radiant rays. Annular Solar Eclipse: This occurs when Moon covers Sun and a ring of radiant rays of Sun is visible. It looks like a bright ring surrounding black disc of Moon. This is one of the rarest celestial phenomenon which is very delightful. Partial Solar Eclipse (Pakshika Surya Grahanam): It occurs when only a part of Sun is eclipsed and only a portion of sunlight is blocked from reaching Earth. Total Lunar Eclipse / Sampoorna Chandra Grahan: This occurs when Earth passes directly in front of moon, blocks the path of sunlight from reaching Moon and casts her shadow on Moon. Partial Lunar Eclipse / Pakshika Chandra Grahan: This occurs when only a part of Moon comes under the shadow region of Earth. Many take a holy dip in the nearby water sources like seas, rivers etc during eclipse. Dharba i.e dried grass blade is placed in Pooja mandap and kitchen items with long shelf life like pickles, curd, oil, clarified butter (ghee) etc as the sharp blades of dharba grass have great purifying effect and protect the perishables from harmful rays during eclipse time. Many finish their meals at least 5-6 hours before the eclipse begins so that the food is completely digested at the time of grahan. And they do not eat anything during grahan period. After a holy shower, many chant mantras as it is believed that the effect of chanting mantra during grahan period becomes manifold. Hindu temples are closed nearly 6 hours prior to eclipse and are opened after purification on completion of eclipse. There is a strong belief (though no scientific reasoning / proof) that pregnant women, particularly those who are in the early stages of pregnancy are supposed to sit without any movement. There is a belief that in case pregnant women move normally, the fetus will have deformity. Leftover cooked food should be disposed off and not to be refrigerated for future use. Many do daan i.e donate raw food items that include rice, pulses, raw vegetables etc (known as 'swayam pakam' in Telugu) to poor Brahmins. People compulsorily have a hair wash / shampooing of hair after grahan ends. Clean the pooja mandir and idols of god and then perform daily pooja. After pooja, food is cooked for having meals. According to Hinduism the rays that emit from Sun or Moon during eclipse are harmful and have negative effects on Earth. Hence Hindus follow certain do's and don'ts to protect themselves from the negative vibes emitted during eclipse. Total Lunar Eclipse: Jan 31, 2018 (Wednesday) - Grahan begins at 5.18 p.m IST. By the time of moon rise, it is eclipsed. Eclipse ends at 8.41 p.m. It is Rahu grasta chandra grahan. People whose birth star is Pushyami and Aslesha are not supposed to view the eclipse.